Your series "I Would Prefer Not To" consists of 22 photographs and action figures in vitrine, labeled based on disorders and psychoses. The series focuses on "men without qualities," males cut off from society by the Internet, videogames, and anime. What drew you to this subculture? Do you think of their withdrawal as a kind of decadence that accompanies historical and literary portrayals of societies on the brink of disaster? Growing up in Hong Kong in the 80s & 90s, it was very easy for a boy to become immersed in the manga and anime that was being imported over here from Japan. For this project, I was drawn to what is popularly known as “otaku” culture partly because of this childhood familiarity. In Chinese, “otaku” is often translated as 宅 男, which although usually spoken in the same breath, actually carries very different connotations. 宅 is short for housing (complex), or tenement (block), and 男 means male. The term thus describes the stereotype of the otaku as a socially inept male subject walled up in his apartment. While this is a generalization of a more complex state of affairs, I do think there is a certain truth to the suggestion that otaku culture arose, or at least thrives within a uniquely urban context. It’s difficult to imagine an otaku pursuing his/her hobby in a log cabin in the woods. My concern with this work then was not why otaku do what they do, but rather, what kind of space allows this to happen? It is as if the extremely dense accumulation of cramped interior spaces that characterize many Asian cities encourages a turning inward, or a vacuum of mental space itself. I hesitate to use the term decadent because of all the moral and cultural baggage that it entails - it was never my intention to judge otaku culture per se. As for the relationship to societies on the brink of disaster - there does seem to be a historical correlation between the emergence of a “man without qualities” and periods of crisis. In Robert Musil’s three-volume novel (The Man Without Qualities), this crisis manifests itself in the decaying edifice of the Austro-Hungarian Empire, which prefigured the advent of WWI. But in Musil’s fin-de-siècle world, the principle concern is with time, entropic ruin and the ever-accumulating dead weight of the past. Today, I think the “crisis” is really a spatial crisis - which does not necessarily entail the rejection of time or history - just that it no longer seems possible to accurately deal with space and time as discreet and unrelated quantities. An interesting parallel here would be the way in which the theory of general relativity (and the notion of space-time) expanded on the foundations set by classical mechanics. Similarly, one finds a technological parallel in the changing mental space opened up by the Internet and virtual reality, as compared to the transformations of (temporal) perception that were triggered by the invention of photography. If we are to think of otaku as a contemporary manifestation of the “man without qualities”, it is necessary to keep these subtle transformations in mind. In both your recent installation "Marine Lover" and your exhibition Cataract, you created closed environments based off of sublime natural phenomena. Your simulated sandscape "Afternoon in Utopia" has a similar approach, though in a more speculative form. What interests you about the interaction between a controlled space and the wild environment it mimics? All of these works take as their starting point a certain generic image of the sublime. In some cases, I appropriated images from the public domain and incorporated these directly into the work - Cataract contains archival images of Victoria Falls from the Smithsonian Institute; and Afternoon In Utopia centers on one of the first images taken on Mars by the NASA Viking Lander in 1976. The reason that I refer to these images as generic has to do with old debates about how the circulation of photographic reproductions came to supersede the uniqueness of every reality. This process of course was greatly accelerated by the Internet. Try doing a Google or Flickr image search of “Victoria Falls, Main Fall” for instance, and count the number of photographs, taken by different people at different moments, but with a strikingly similar viewpoint and composition. These images have effectively gelled into one image, which is the ultimate cliché of Victoria Falls; to the extent that I wouldn’t feel like any trip to the actual site would be complete without finding the spot where tourists took this same picture over and over again. The fact that I have never seen Victoria Falls in person only adds to the sense in which the image takes precedence over reality. The same situation applies to the coral reef in Marine Lover - I was really more interested in connecting this work to the kind of mediated armchair exploration propagated by National Geographic than any direct engagement with a coral reef. Hence despite appearances, I am not really mimicking a “wild environment”, but a popular idea of the wild, which may not even exist. A curator recently told me that the Marine Lover installation reminded him of an elaborate entrance to a seafood restaurant. While this was meant as a criticism of the work, he was perhaps not far off, since there is always this underlying fascination with the kitschiness of the generic image. In Afternoon In Utopia, the situation was modified somewhat, because the NASA photograph depicts a place (Mars) that I could not possibly see with my own eyes. And what is does this image consist of? A barren landscape that could just as easily be Death Valley, or a rock strewn beach somewhere on Earth. Yet if I am to believe what the caption states, that this is Mars, then I will nevertheless only ever see it as an image; always and already displaced and ungraspable. Not a distant object, but that object as distance; a strange and disembodied resemblance. This is where the constructed environments come in - as a way to project this same imaginary identification onto situations that we might encounter in our day-to-day lives. 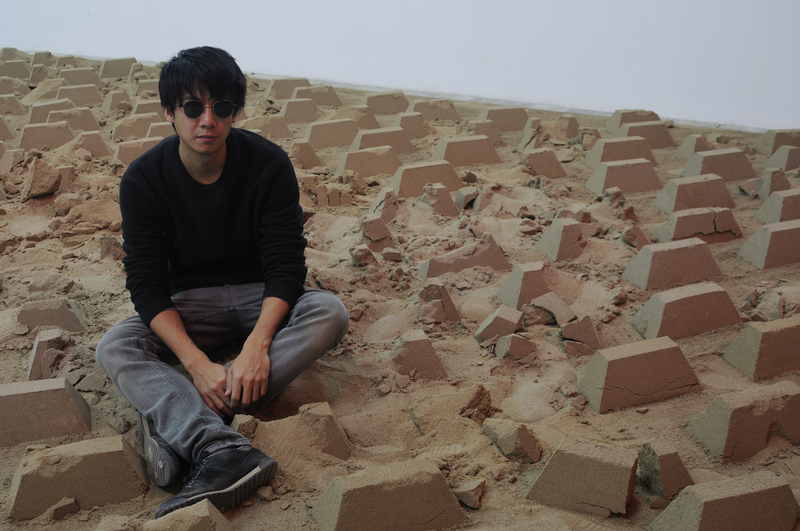 With Afternoon In Utopia, that materialized in the form of a large sandscape that filled the room, modeled after the terrain of concrete islands that can be spotted beneath highways and road intersections. 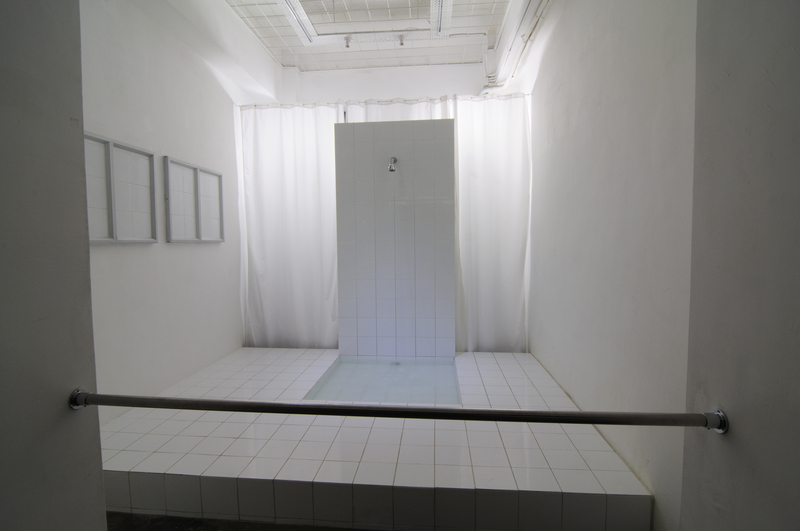 In Cataract, part of the space was transformed into a monolithic freestanding shower that ran constantly for the duration of the show (the water was recycled via a pump mechanism); replete with all the trappings of a tourist site. You've described yourself as having a "fetishistic" approach to the subcultures that serve as subjects of much of your art. What do you think your relationship to these subcultures would be if you weren't an artist? Could you see yourself being involved as an enthusiast? There is a quote by Georges Bataille that summarizes this relationship: “I defy any amateur of painting to love a picture as much as a fetishist loves a shoe.” Although I wouldn’t call myself an enthusiast, I do display an irrational fussiness over the objects in my possession that can be quite suffocating at times (to both myself and those around me). Sometimes, making art actually liberates me from this affective attachment to objects, by providing some reflexive distance. Nevertheless, the simple act of acquiring objects of desire like the action figures in I Would Prefer Not To demanded a modest level of immersion into the rituals and customs of the collector. I would spend hours on end trawling through clusters of specialist shops in search for the “right” combination of figures. Thankfully, after all was said and done, it was relatively easy to drop the whole subject and move on to something else. To be an enthusiast seems to require a kind of intense and inexhaustible commitment. I think my attention span might be too short for this - I guess that makes me an amateur enthusiast? I suppose since art college, where I started to make work that dealt with the mechanisms of photographic perception. I use my camera a lot, but very often the photographs that I take don’t end up as works themselves, perhaps because I am always more interested in how the way one sees through a camera can be projected onto live situations, or because it is more appropriate to use a found image. When I was in art college, the transition to digital photography hadn’t happened yet, so I spent a lot of time in the darkroom. Nowadays that translates onto time spent on Photoshop. When it comes to constructing things, it’s a bit like being a builder, or painter-decorator (one of my most cherished volumes in the studio is a copy of the Collins Complete DIY Manual). Actually, most of my basic knowledge in this area came from wood shop class in secondary school; the rest was picked up in bits and pieces along the way. I also like to cook, and I have a lot of kitchen equipment, which sometimes gets used for art making purposes - you might say that I think about installing a show much the same as I think about cooking a three-course meal. I studied ceramics, then sculpture at Chelsea College of Art in London, followed by a postgraduate degree in comparative literature at the University of Hong Kong. I have often thought about doing a series of paintings, to the point where I have gone out and bought all the brushes and canvases, etc., but it always ends up becoming something completely different, i.e. not painting. The problem that arises is usually how I can justify the act of painting when there seems to be some other more appropriate way of achieving what I am looking for. Drawing is an activity that I feel much closer to - the directness and simplicity of a pencil or pen on paper, or even hastily squeezing a blob of plasticine into shape (if you could call that drawing). Incidentally, I feel that there is something of the directness of drawing that applies to the construction of an animated GIF. I sing and play keyboard/guitar in a local band called A Roller Control. I hold some part-time posts in art colleges around Hong Kong, teaching a range of studio, theory and art history courses. Naturally this has provided me with a practical, theoretical and historical supplement to my own practice. It’s also interesting to follow student’s concerns into territory that one might not normally tread. With Joao Vasco Paiva, on fun little project called Hong Kong Catwalk (http://www.hongkongartwalk.com/2012/images/catwalk.jpg). 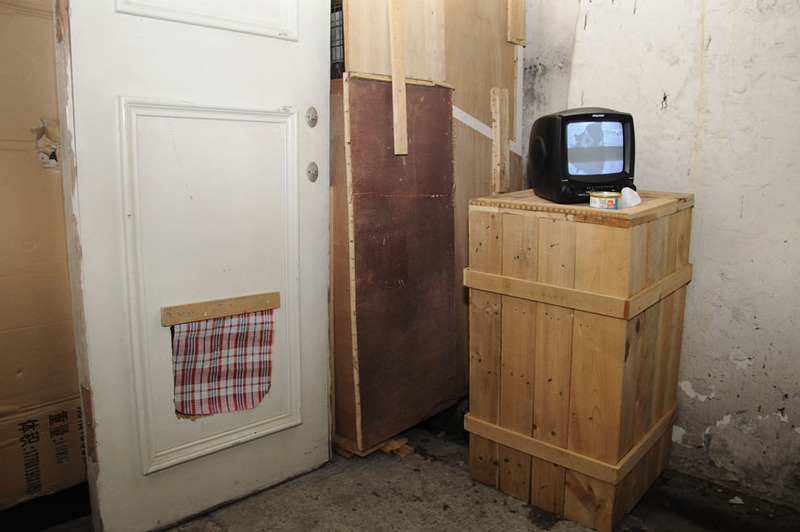 I also worked together with Magdalen Wong and Erkka Nissinen on a self-organized group show, No Longer Human, which is where I developed the work that became Afternoon In Utopia. Yes, for teaching as well as personal interest. I recently began making animated GIF works for exhibition purposes, which involved playing back the GIF files on small standalone media players or digital photo frames that were GIF compatible. My interest in the file format came about via the accidental discovery of the animation tool in Photoshop, which I first used to construct a cascading waterfall animation for the front page of my website during the Cataract project. It was not until much later that I considered producing GIFs as works that could be exhibited in their own right; also the subsequent discovery of a whole group of artists who are already working in this field. Being a format that is associated with the Web and a particular open source ethic, one of the questions that came to mind was how the offline circulation of individual GIFs-as-art would affect their online presence, particularly if the work gets bought by a collector. Perhaps the most intriguing thing here is that there is currently no standardized rule as to how one should handle this problem.